In 1949, Charles and Ray Eames developed a system of multifunctional shelves and desks which – similar to the Eames House that dates from the same time – were constructed strictly in keeping with the principles of indus- trial mass production: the Eames Storage Units (ESU) and the Eames Desk Units (EDU). - Tabletop: plywood with maple veneer. - Screens: coloured lacquer. - Metal surfaces: brushed and chromed. - Feet: height-adjustable. The Vitra Eames Desk is perfect for all kinds of offices and work spaces. The desk offers shelves and storage for all kinds of needs and its design suits all kinds of environments. 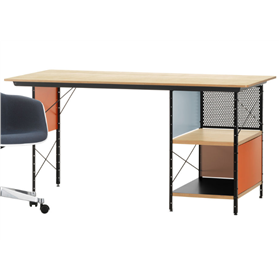 Whether you are looking for an Eames Desk or other kind of desk unit, we have a range of office furniture to meet your needs.